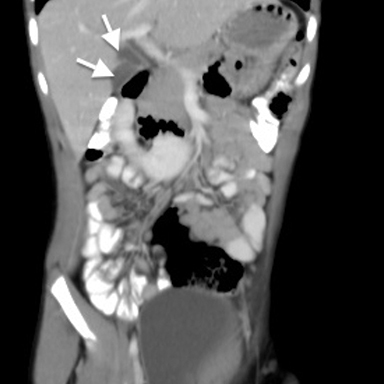 A 9-year-old boy was referred to the Department of Radiology with complaints of dull pain in the right upper quadrant of abdomen, nausea, vomiting and feeling of unusual fullness after meals. Physical exam showed no evidence of tenderness in the right upper quad rant and negative Murphy’s sign. Laboratory findings, including transaminases, lactic dehydrogenase, total bilirubin, alkaline phosphatase, and white blood cell count, were within normal limits. The patient’s temperature was 37.5°C and the rest of his vital signs were normal. 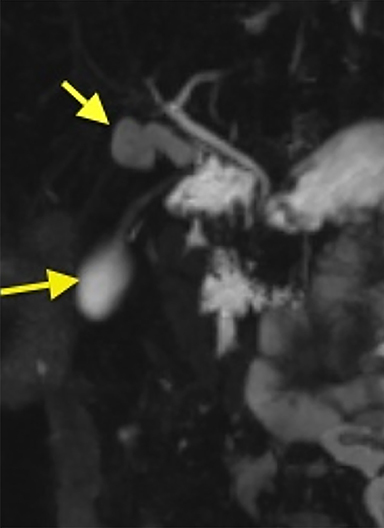 Ultrasound and contrast-enhanced computed tomography (CECT) of abdomen and magnetic resonance cholangiopancreatography (MRCP) was performed. Ultrasound of abdomen showed two anechoic ellipsoid cystic structures in the gallbladder (GB) fossa. Both the kidneys were malrotated with poor visualization of the inferior poles (not shown here). CECT of abdomen was performed. 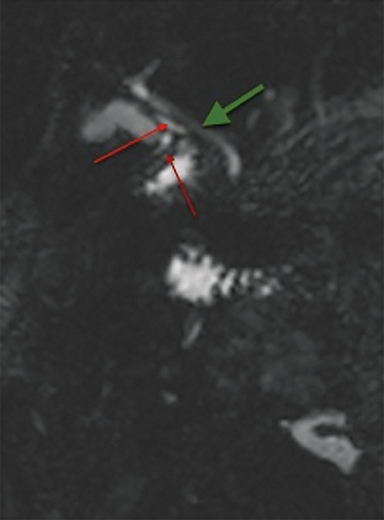 The inferior pole of both the kidneys were medially rotated and fused in the midline anterior to the aorta and inferior vena cava (IVC), with no evidence of hydroureteronephrosis and renal calculi (Figure 1). Two hypodense ellipsoid cystic structures were noted in GB fossa with two cystic ducts joining to form a common duct, which communicates with the common hepatic duct to form the common bile duct. These findings were confirmed on MRCP (Figures 2, 3A, 3B). It is important to recognize gallbladder duplication due to the clinical, surgical, and imaging difficulties. Accurate pre-operative diagnosis of this anomaly becomes important to prevent possible surgical complications and repeated surgery. Differential diagnosis for duplicate gallbladder includes a folded gallbladder, choledochal cyst, phrygian cap, pericholecystic fluid, gallbladder diverticulum, and vascular band across the gallbladder. When double gallbladder is diagnosed, surgery is recommended. As in our case, surgery was performed and pre-surgical imaging findings were confirmed post-operatively. No intervention is required for incidentally found asymptomatic and uncomplicated horse shoe kidney. It is very important to recognize duplicated gallbladder preoperatively to prevent surgical complications and repeated surgery. Boyden EA. The accessory gallbladder: An embryological and comparative study of aberrant biliary vesicles occurring in man and domestic mammals. Am J Anat. 1926;38:177-231. Udelsman R, Sugarbaker PH. 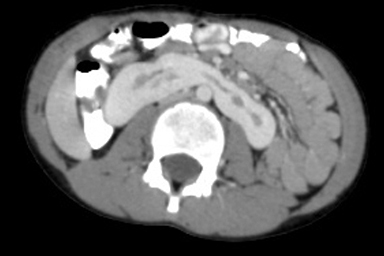 Congenital duplication of the gallbladder associated with an anomalous right hepatic artery. AJS. 1985;149:812-815. Desolneux G, Mucci S, Lebigot J, Arnaud JP, Hamy A. Duplication of the gallbladder: A case report. Gastroenterol Res Pract. 2009;2009:1-3. Gocmen R, Yesilkaya Y. Imaging findings of gallbladder duplication due to two cases: Case report and review of literature. Med Ultrason. 2012;14:358-360. Chamaria K. Duplication of gallbladder and horse-shoe kidney. Appl Radiol. 2016;45(1):34-36. Prepared by Dr. Chamaria while a Radiologist at the Dr. Ram Manohar Lohia Hospital, New Delhi, India.